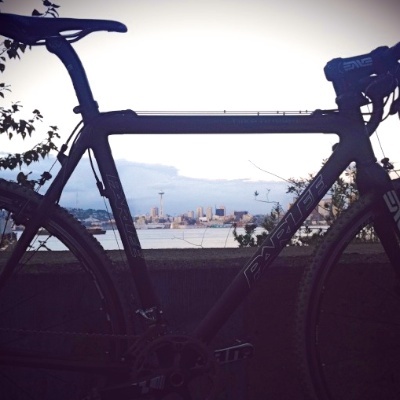 Where I train in West Seattle, the Space Needle is always just around the corner. It’s in the triangle of the frame, middle left and this bike is the Parlee CX H (for Hugga) that I’ve got in on test. It’s a custom carbon cross bike that weighs 15 pounds and I’m racing it like I was a Belgian with dangling gold chains. Much more to it than that, but that’s a good start.